As your complete source for your entire hollow metal door needs in Arlington, Texas, Metroplex Exit Doors, Inc. offers installation, repair and custom fabrication services to meet your needs. Below you will find a brief summary of those services. If you are in the Arlington area and you have any questions or we can assist you in any way, please contact our office at 972-723-3994 or you may also request services from this site. Utilizing products such as Schlage, Hager, LCN, Yale, Global, Pemko, Bommer, Von Duprin, Norton, and Corbin Russwin, our expertly trained Arlington installers, will provide you with the very best installation of your new doors with each and every visit. We are also experts at retro-fitting new equipment into your existing facility. By offering a full service to only commercial and industrial customers in Arlington, Texas, we are able to stay abreast of the latest installation innovations in the hollow metal door industry. We invite you to tour the new installation page of this site for further details regarding our installation services at Metroplex Exit Doors, Inc.
At Metroplex Exit Doors, Inc. we specialize in commercial hollow metal and other door repairs. If your Arlington door is sagging due to a hinge failure or for any other mechanical reason we can repair it. In addition, if you need to replace your metal door or reinforce it due to criminal activity, you can have the peace of mind that our experts at Metroplex Exit Doors, Inc. will soon be on their way. 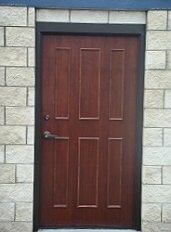 At Metroplex Exit Doors, Inc. we are also happy to provide free estimates for repair work in the Arlington, Texas area and will repair any kind of hollow metal door, whether it is a standard steel door or a fire rated door. We will also repair 20,16,18, & 14 gauge metal doors, cold rolled and galvanized steel. We would like to invite you to tour the repairs page of this site for a complete summary of repair services we offer. Metroplex Exit Doors, Inc. have the engineering capability and skill needed to custom design your doors, frames and accessories that meet a variety of custom applications. We can provide arched or radius frames, bullet-resistant doors, stainless steel, sound rated openings, stile and rail wood doors. 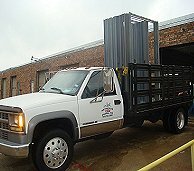 We have one of the best-equipped fabrication shops in the Arlington, Texas area. We are proud to have established relationships among architects and designers in Arlington, Texas, who use our product to apply frames, doors and finish hardware in a variety of commercial settings. We have supplied a large portion of the schools, medical facilities and corporate office buildings in our market area. But "big" isn't our only focus! We are also available to serve our fellow small business owners throughout the Arlington, Fort Worth metroplex. Please tour the custom fabrication page of this site for further details regarding our installation services. If you are in the Arlington area, and you have any questions or would like to schedule a free service call, please feel free to contact Metroplex Exit Doors, Inc. at 972-723-3994 or you may also request services from this site.